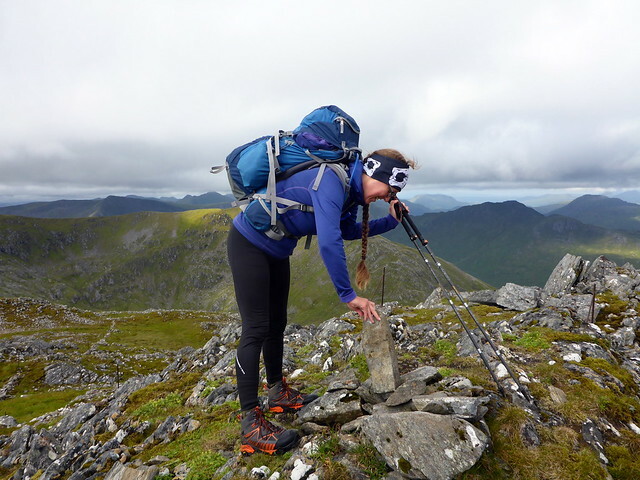 Kintail this weekend - in pursuance of SK's Tops with some Marilyn action thrown in. 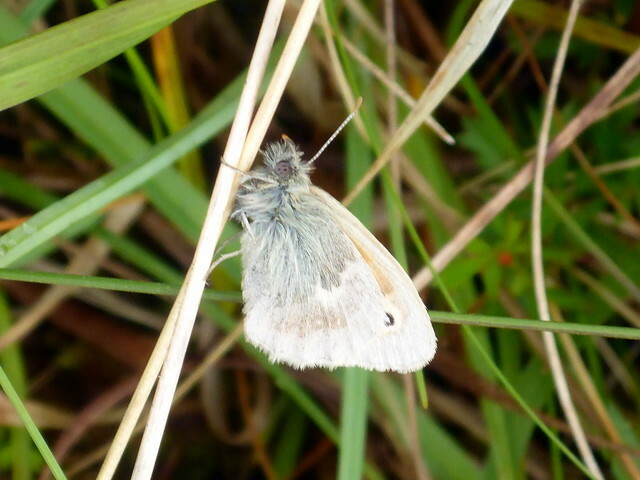 Fortunately my left knee has recovered from the bashing it got in Assynt last Sunday and is working normally - albeit coloured an unbecoming yellowish as the bruise develops. Although the forecast seemed better in the East I wanted West, plus I have diminishing faith in forecasts these days. Met Office and Yr.no suggested a wet weekend with Friday the best of a bad lot - ach well. 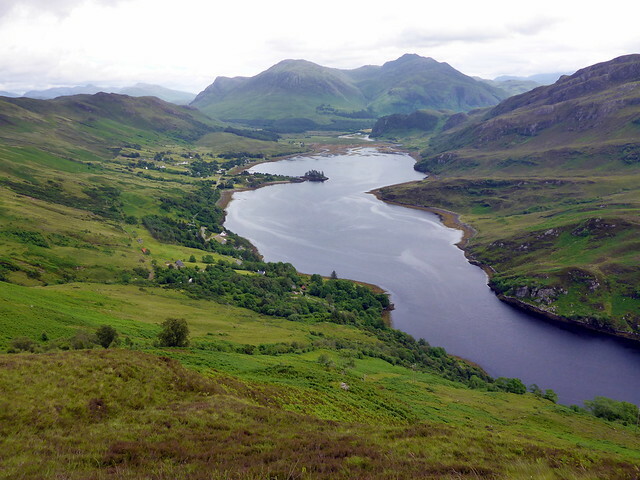 I would get the chance to put into place a route that's been on the drawing board for some years - in fact ever since we had to foreshorten the Mullardoch Round and miss out Dheiragain & Ceathreamhnan. 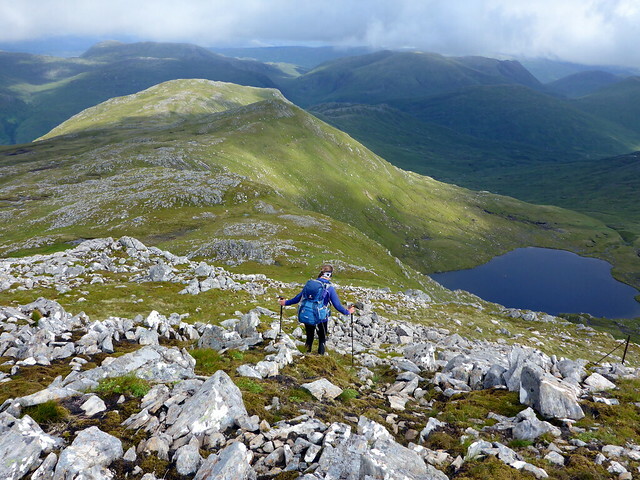 An approach from Iron Lodge as a circuit appealed and - with SK needing the Tops on both Munros - here was a chance to try it out. 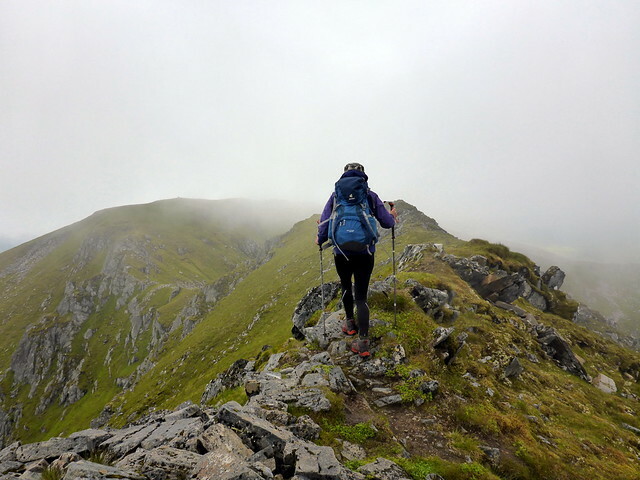 Plus completing the entire north ridge of Ceathreamhnan adds on two Simms, plus a sneaky Marilyn on the return to Carnach. 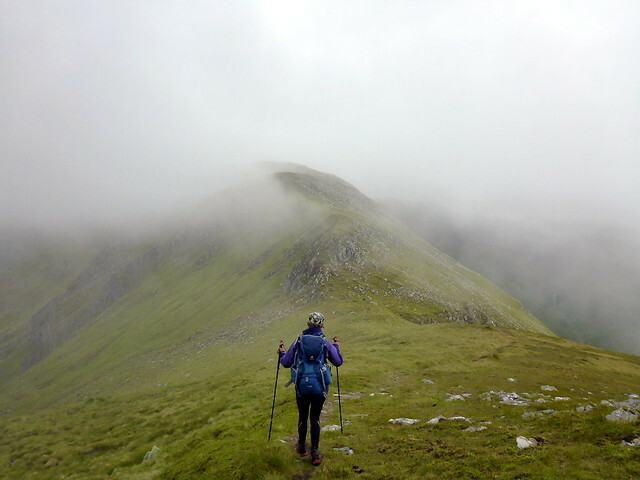 We drove up on a wet and misty Thursday evening, having decided to pitch at Shiel Bridge rather than start the walk in down Glen Elchaig in the rain. All a bit soggy underfoot, not helped by a lot more rain overnight. Drove round to Killilan and parked at the start of the immaculately presented Inverinate Estate, setting off in mist and smirr with the hope that it would brighten later. A very jolly chap at the farm asked us if the rain was going to stay off for us. We thought not. 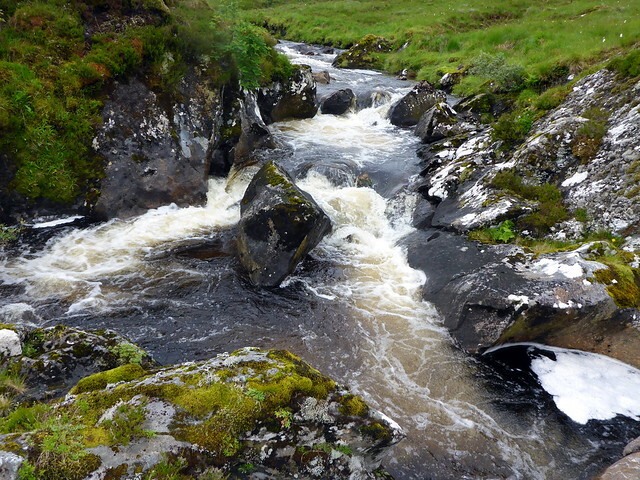 The River Elchaig looked full and fast flowing as we marched along the track. 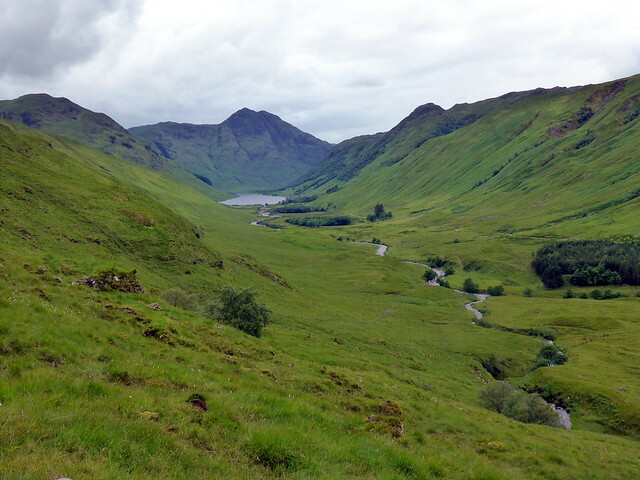 We've been down here quite a few times now, always for lengthy outings and usually eaten alive by midges at some point. Today there was enough breeze to keep them at bay. 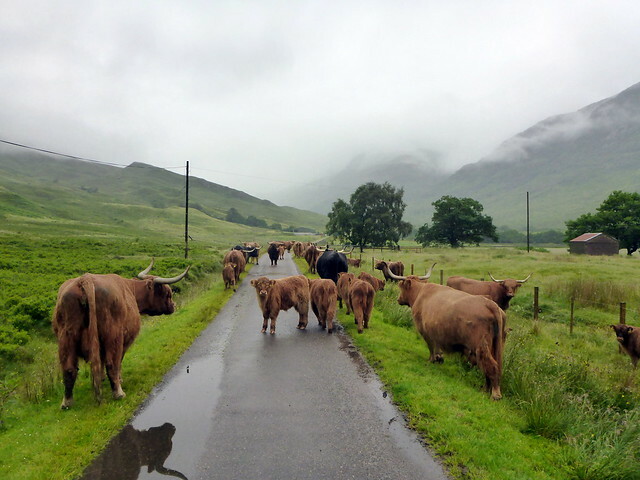 We passed through a large herd of docile coos (with Mr Bull right in the midst of them), walked alongside Loch na Leitreach then Carnach and onto Iron Lodge. 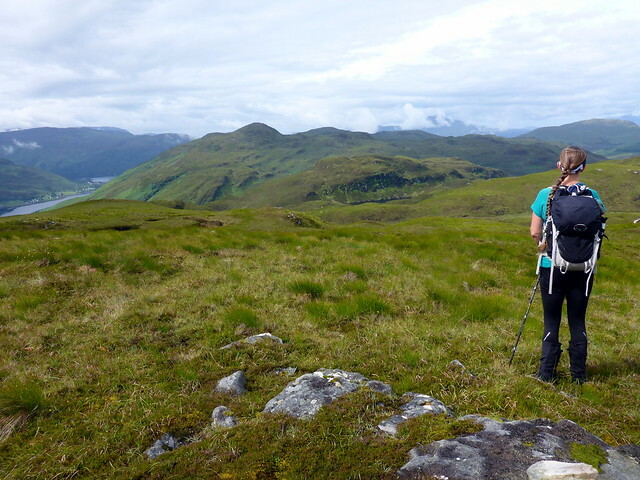 Last time we'd been here was to do the Grahams Breabaig and An Cruachan - we followed the same zigzag track up the slopes of Breabaig but continued round the hillside this time. 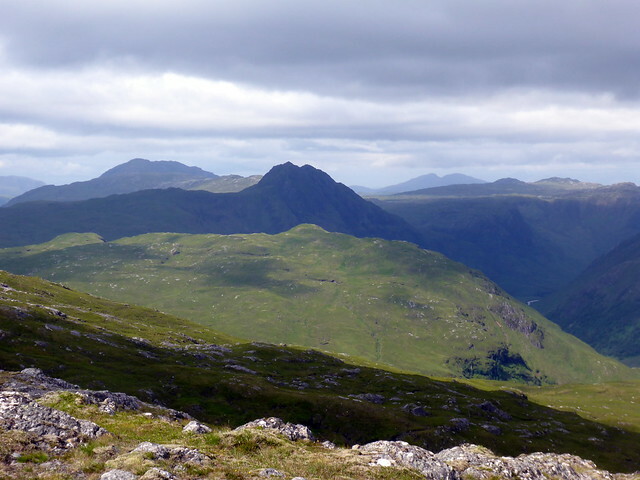 Ahead of us we could see the long flank of Dheiragain sloping to the right with Beinn Fhionnlaidh behind. 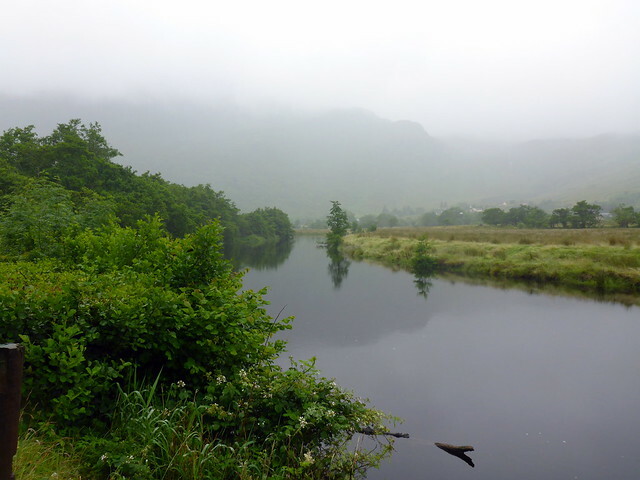 The path became boggier but there were duckboards over the several river crossings, which was helpful given the fullness of the streams today. 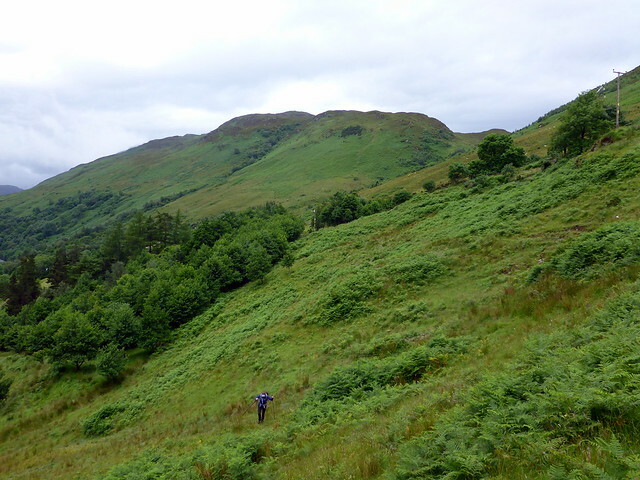 The direct approach up the west flank of Creag a'Choir' Aird was selected and uneventfully climbed, following a grassy rake most of the way. 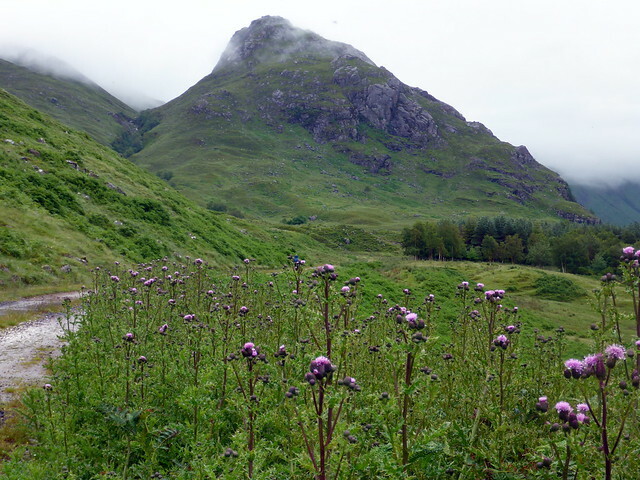 Onto the broad ridge - we met a couple of guys hiking in wellies who had cycled by us earlier on the track. Footwear to think about for some of the hills we do, certainly. 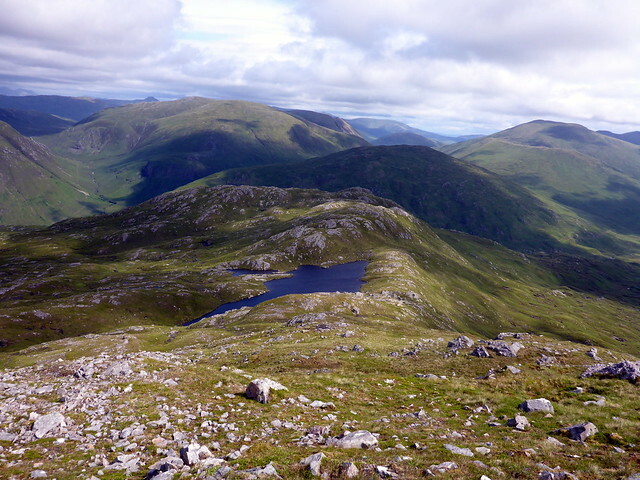 Onto the first Top of Mullach Sithidh and over the Munro summit, views down to Loch Mullardoch to our left. By this time it was after 4pm. 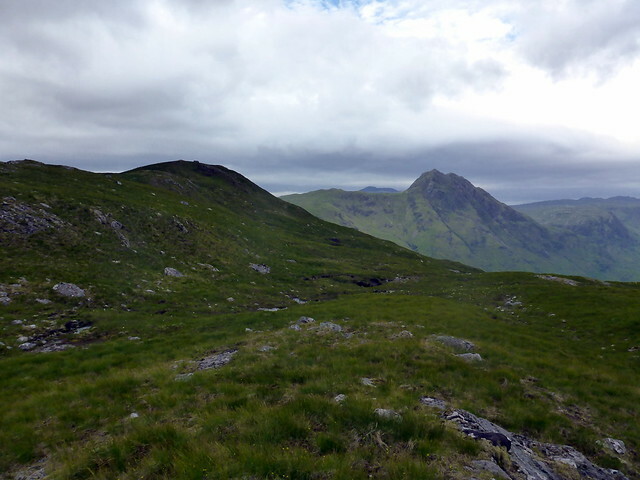 I had intended to camp high - previous experience suggested we either camp around Carn a Con Dhu or between the third and fourth Top on Ceathreamhnan as there was little option between these points, the ridge being too narrow/stony. 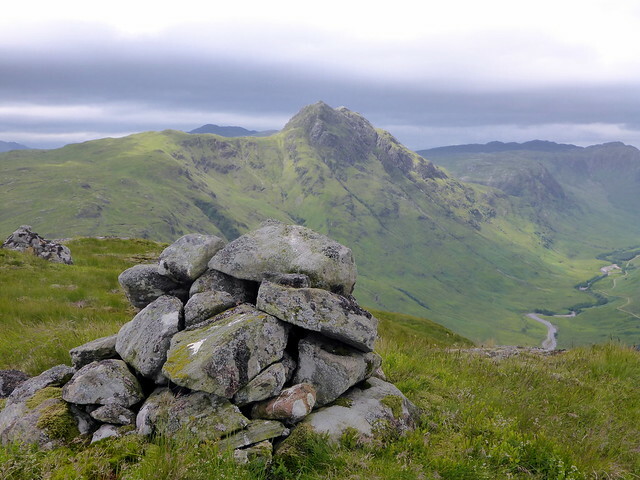 My preference had been to head round to Ceathreamhnan today but it was starting to rain and the wind was getting up, blowing right across the ridge from the south west - made sense to stop on Carn a Con Dhu where there was shelter and flat ground. So we did just that, had our tea of delightful dried rations and settled down to pass the night. Not much of a view from the spot we'd chosen. The night passed with intermittent rain and even some early morning beams of sunshine. 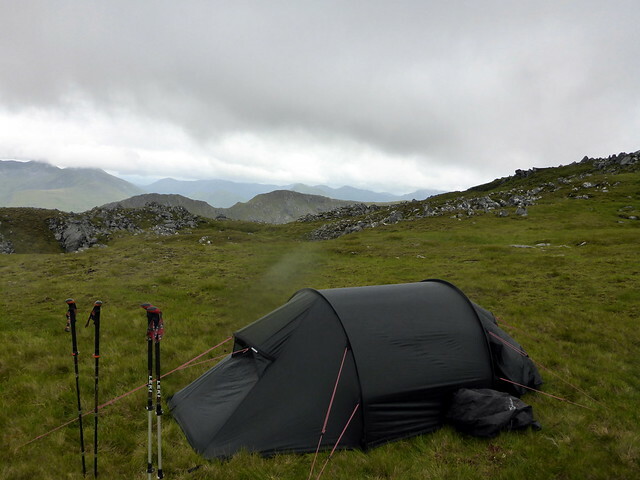 Packed away an almost dry tent (thankfully) and set off on what looked like a reasonable morning - some mist coming and going on the summits but plenty of hills visible in the distance. 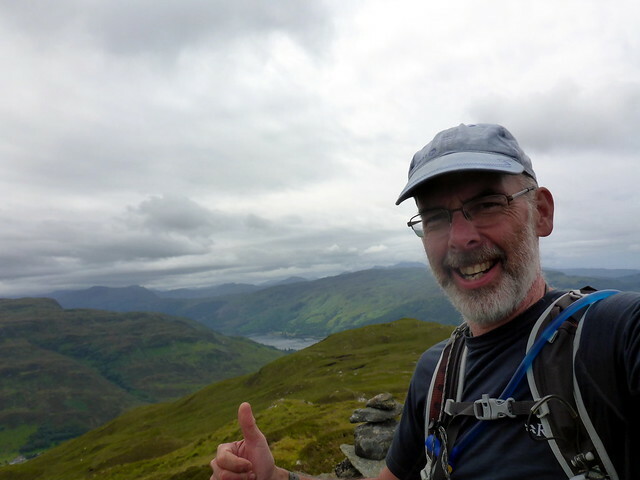 Up the steep part of the ridge to the summit of Ceathreamhnan, remembering that it was, at one time, going to be my compleation Munro, before a more fitting candidate took over. Onwards to the West Top then down the spine to complete the 4 Tops on this one ridge. 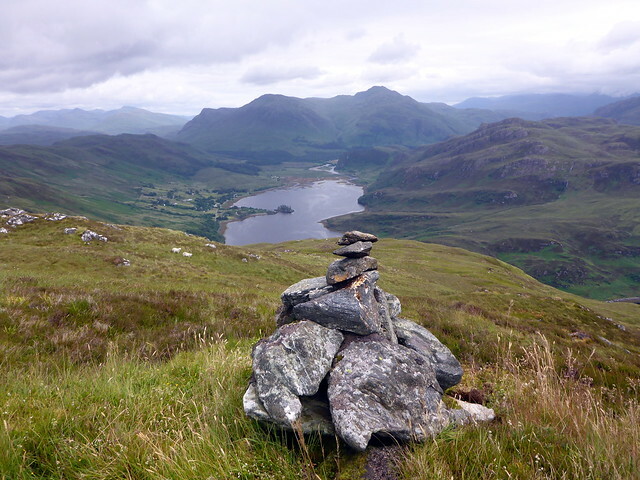 I kept thinking back to when I did these tops myself, from a campspot around Carn a Con Dhu after walking in over the four northern Mullardoch hills, heading out then back to my tent - the final top, Stuc Fraoch Coire being a particular pig as it seemed so far from the third Top. 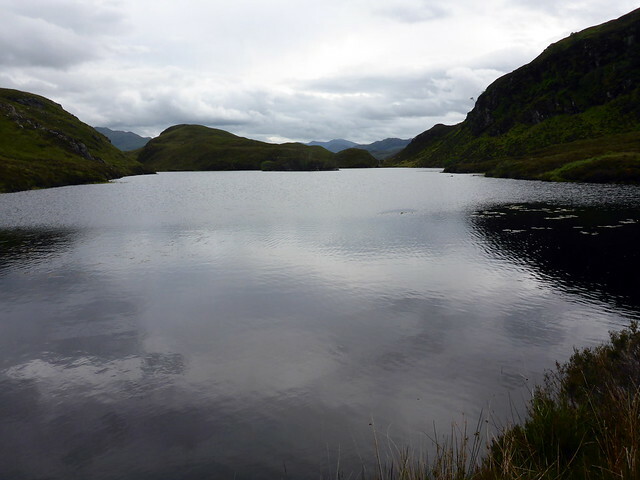 Today however we were only going one way After Fraoch Coire we continued onwards to Creag Ghlas at 856m then skirted around Loch Sgurr na h-Eige to climb the eponymous Simm at 657m where we stopped for lunch. 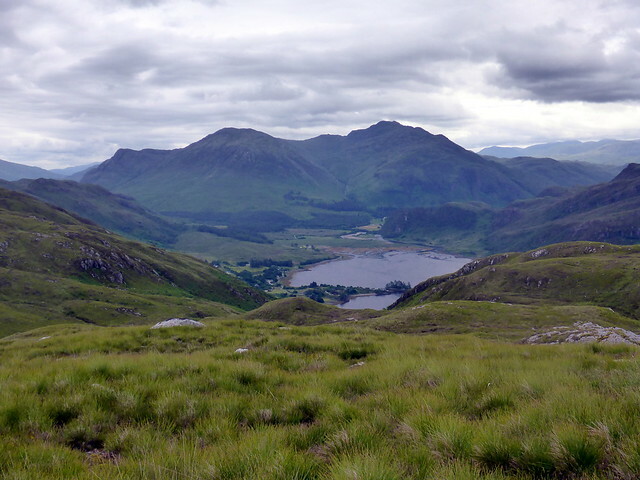 Some fine moody views of the surrounding ranges - Strathfarrar, Mullardoch etc. 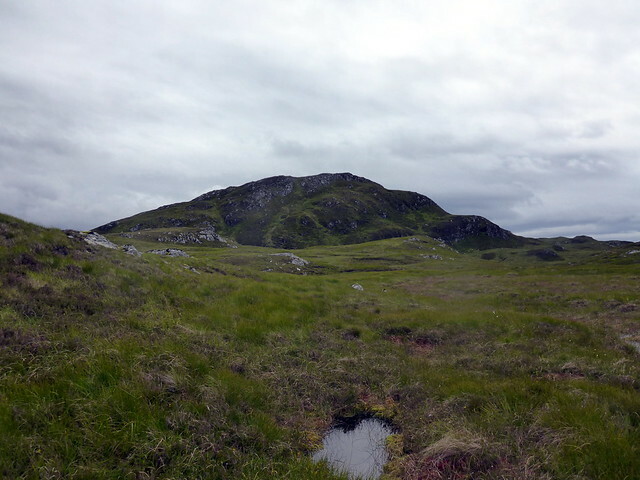 And that special Graham, Carn Cruithneachd, one of the the most impressive/daunting Grahams. But more of that later. 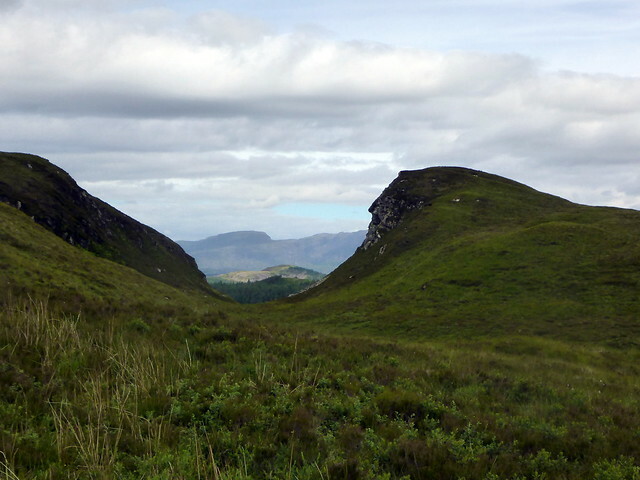 From here we descended westwards aiming to join a track that would take us back to Carnach by means of Coire Easach. 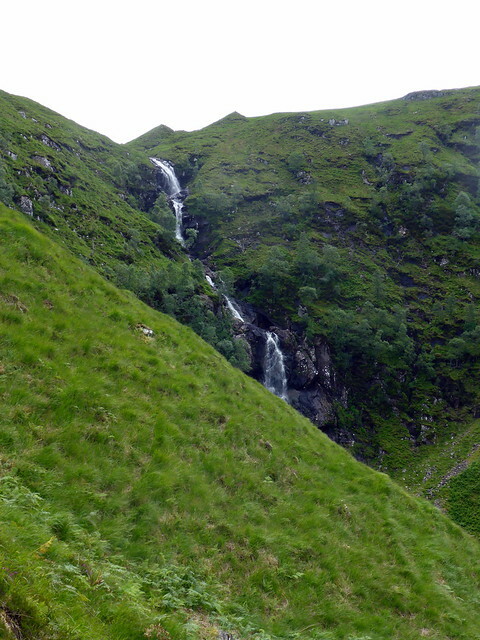 I hoped to tag on the Marilyn of Meall Sguman but this depended on how easy it was to cross the Allt Coire Easach - I'd looked at the waterfall coming from it as we walked up the track the day before and thought it might be tricky. However it was fine and the Marilyn was easily attained - we left our packs down by hte river and had the bliss of being unladed during our ascent. 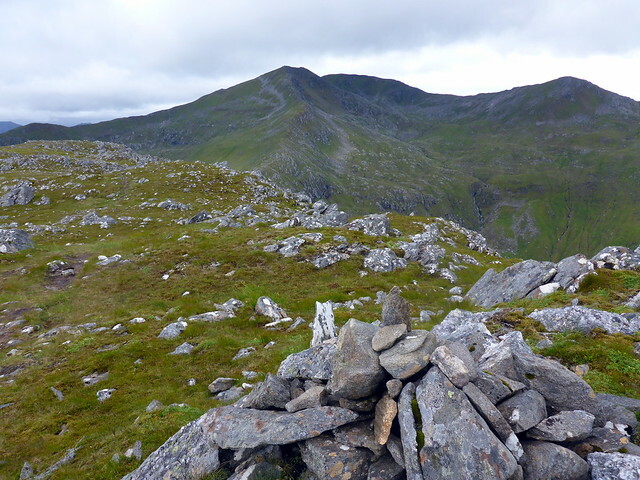 The summit provides a fine view of Carn Cruithneachd - well do I remember scrambling up the steep walls of Coire an Uinnsinn to climb it last year. 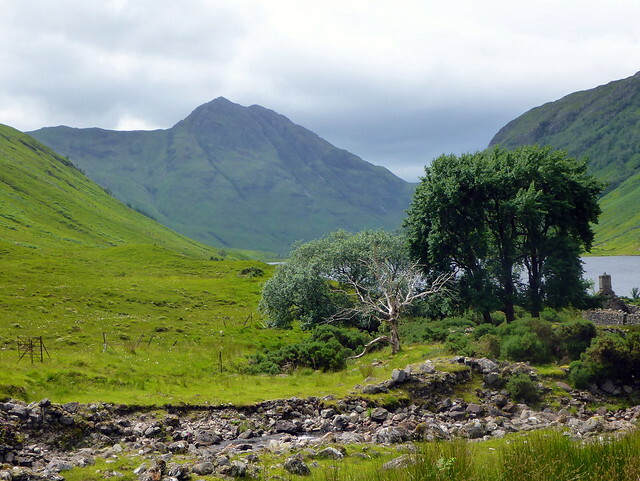 We returned to our packs and joined the stalkers path to Carnach, enjoying the watrerfalls. Back on the track it was simply a matter of walking the 10k back to the car now. 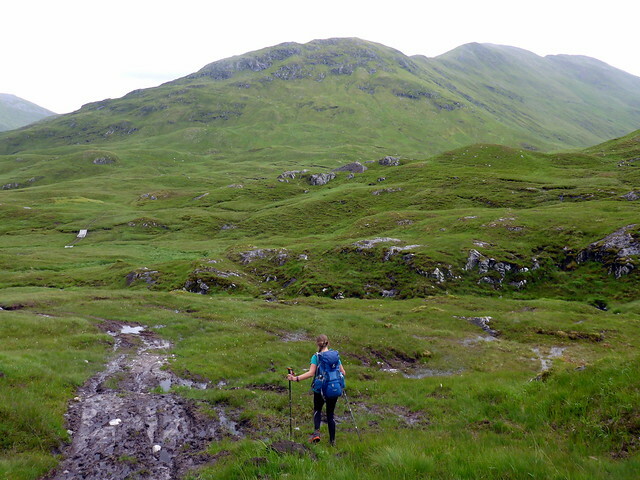 My feet were a bit sore - a blister on the sole of my left foot was an unaccustomed irritant. We were both very hungry but aware there was plenty of food in the car. Where to put the tent, that was the question. 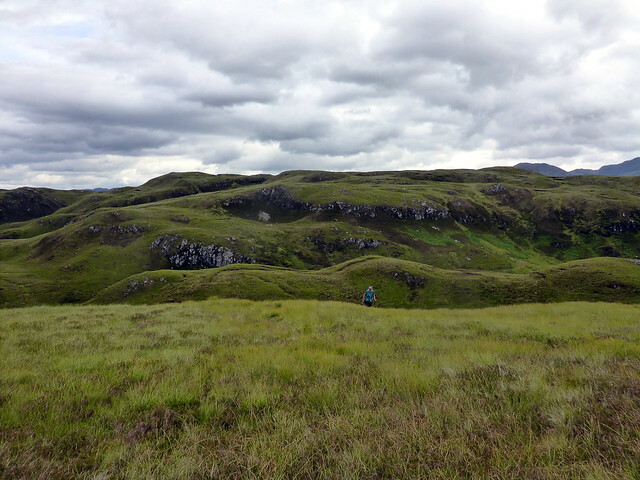 As we were planning on setting out from Sallachy the next morning I didn't want to drive back to Sheil Bridge or Morvich - in the end we pitched in a fallow field just beside the car-parking at Killilan. I wasn't sure if this would be frowned upon by the estate, but we were as discreet as possible and planned to leave before 8 the next morning. After all the overnight rain it was a surprise to find a reasonable morning awaited us. 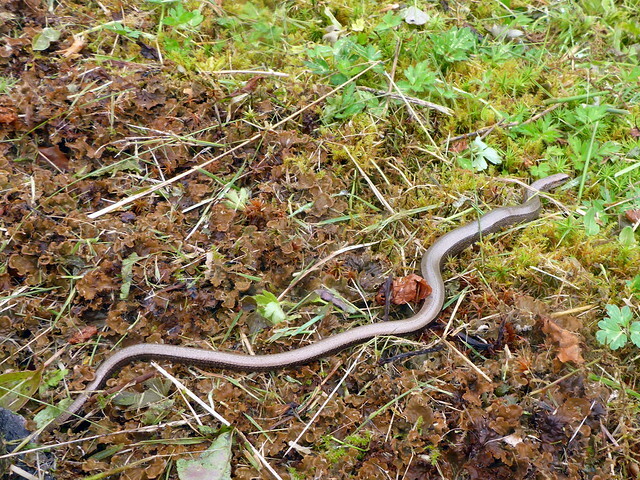 Up at 7 and packed up to go before 8 as planned, Allison noticed a slow worm by the parking area. Drove the short distance to Allt na Subh and parked in a layby with little idea of how we'd get from the road to the hillside other than forcing our way through dense bushes. 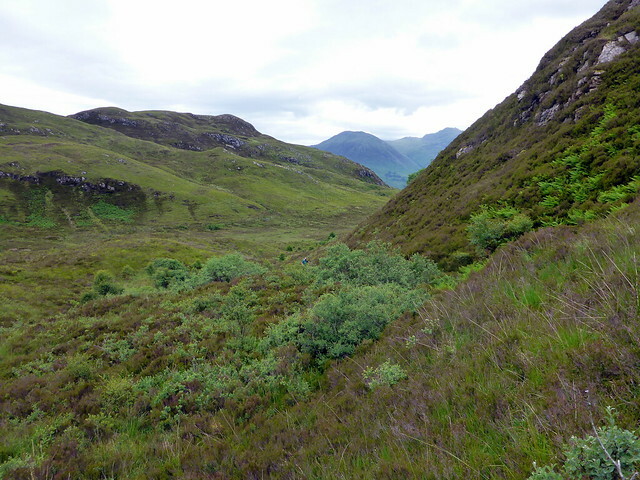 We were able to clamber up and over a fence beside the house we'd parked at and begin a steep climb towards Creag Mhor. 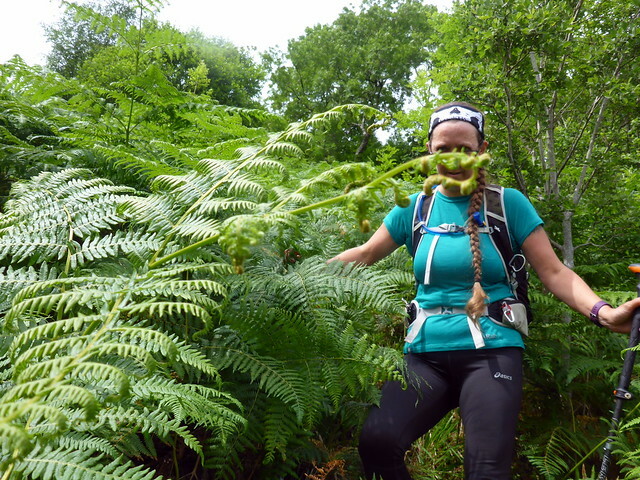 The bracken had retained all the water from last night's rain so trousers were soon sopping, despite gaiters. 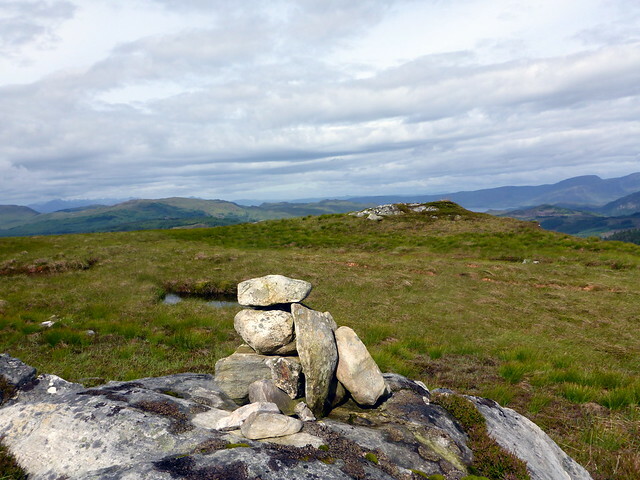 We came to a craggy section then up to what we took for the summit, with a "cairn" of one stone. Keen to get on with the trek to Conchra we headed off - but something didn't look right on the GPS (no map for this hill as it falls between about 3 different OS50000 maps) - I then spotted that we hadn't reached the summit at all - it was another 500m or so to the north SK was mightily impressed to have to backtrack. 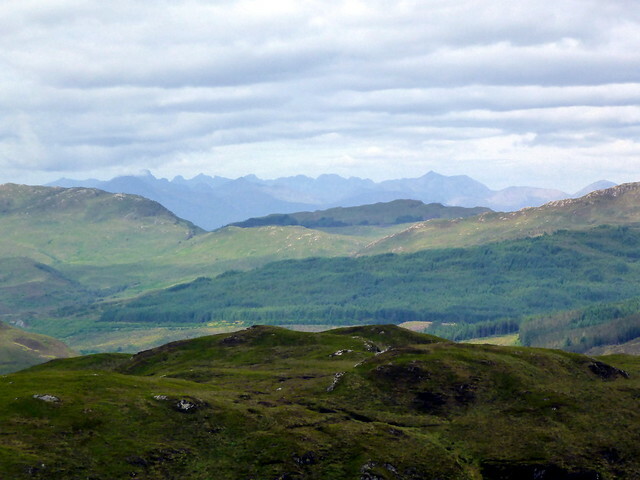 Good views towards Torridon and Skye - the Kylerhea hills in particular standing out. 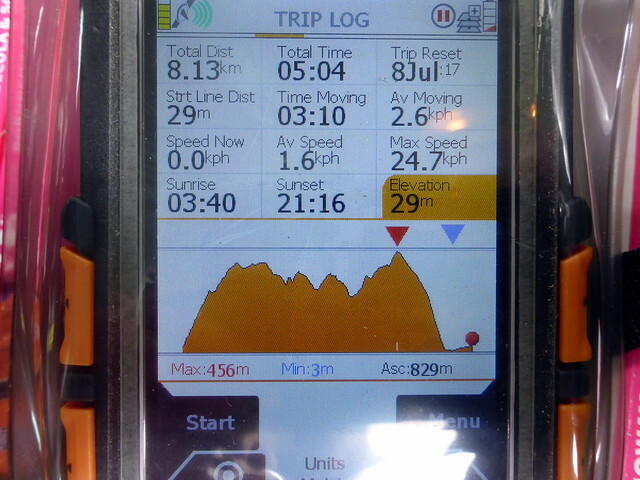 We set off across undulating terrain for the distant heights of Conchra - before we set off I had reckoned that we'd be done in about 3 hours - how wrong was i about to be! 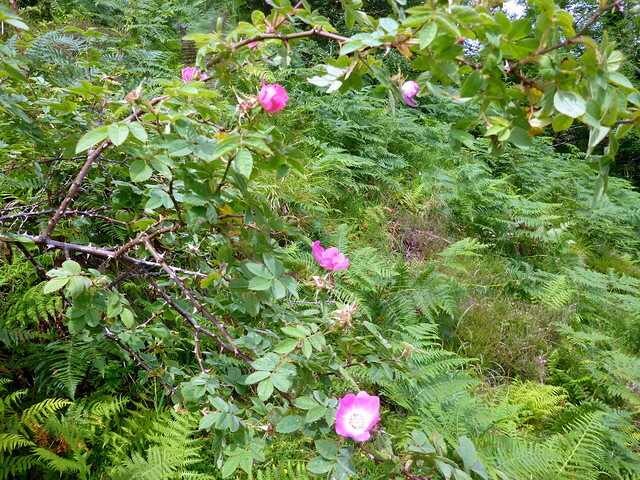 A succession of drops and climbs in soft mossy/tussocky ground that SK described as "wading knee deep through syrup sponge" proved draining and progress took much longer than anticipated. Allison's back does not like such foliage and she was cursing the general idea of Marilyns - I was finding it tough going myself. 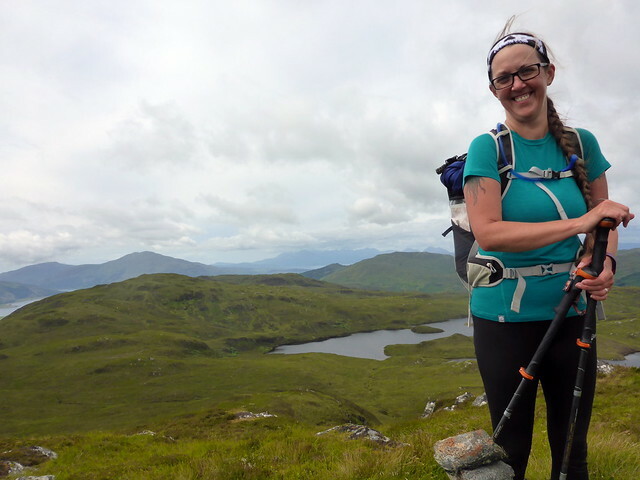 I had thought that Grahams were harder than Munros - was i about to find that Sub 2k Marilyns were going to be harder than Grahams??? 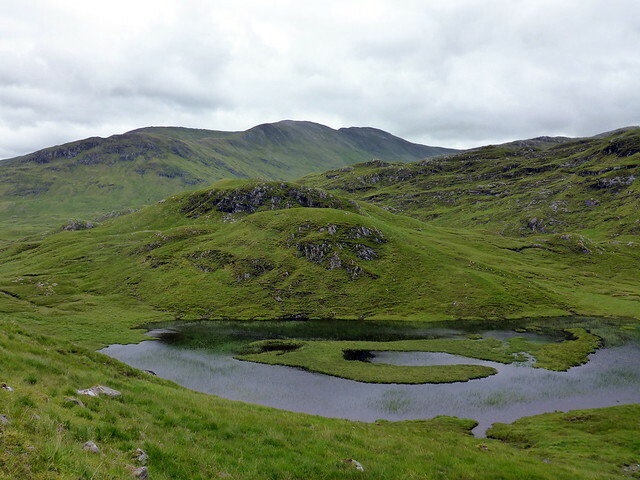 We rounded Loch Thollaidh- a lovely hidden spot and set off up again, down again, over a deer fence into some new native tree plantings before we finally reached the spine of Conchra. My 50th Sub - yeah! Descent was along the eastern shoulder, passing some cows grazing in high pasture then a steep section to the road through bracken and gorse. If you wished an easy ascent of this pair, it might be simpler to do them individually, although I rather enjoyed the untrodden landscape. I thought it was your motor I parked next to on arrival at Killilan on Saturday morning Al. 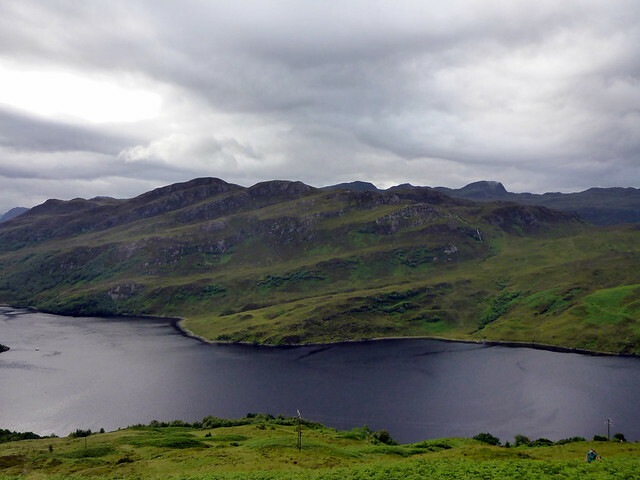 I was off on an 'epic' day trip to Mullach na Dheiragain and back. I noticed the tent in the field on my return at 9.00 p.m. too and did wonder to myself a) where did that come from (as I swear it wasn't there earlier in the day) and b) was it you and Allison. Hope I wasn't too noisy as I struggled to function while getting ready to head home. Those last few miles along that track were certainly a struggle for sure and I was goosed by that stage. 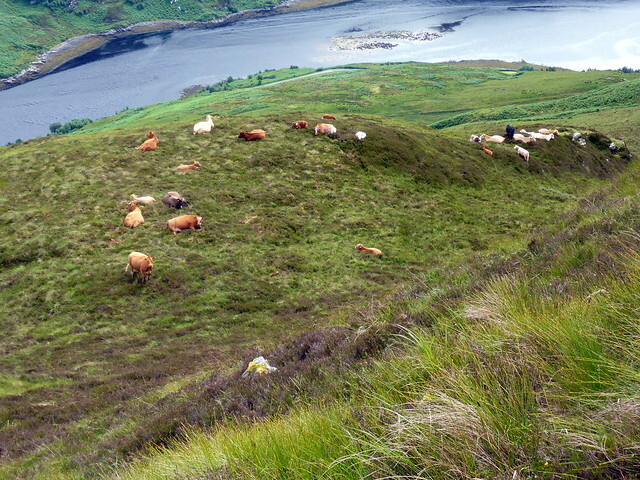 I must say the Highland Bull was very docile for me too Was just sitting and looking very disinterested on my return. One of his 'wumin', however, decided initially to block the gate and not let me through for a few minutes Took a bit of rattling the gate to get her to shift. 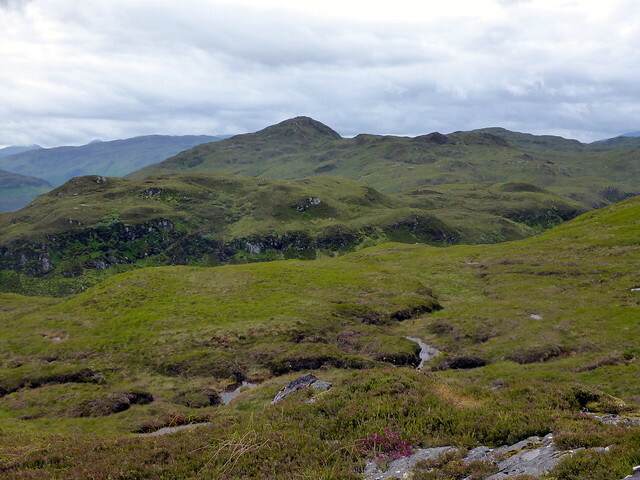 A great area though and certainly somewhere I'm looking to return to in order to pick off Corbetts, Grahams and subs. PeteR wrote: I thought it was your motor I parked next to on arrival at Killilan on Saturday morning Al. 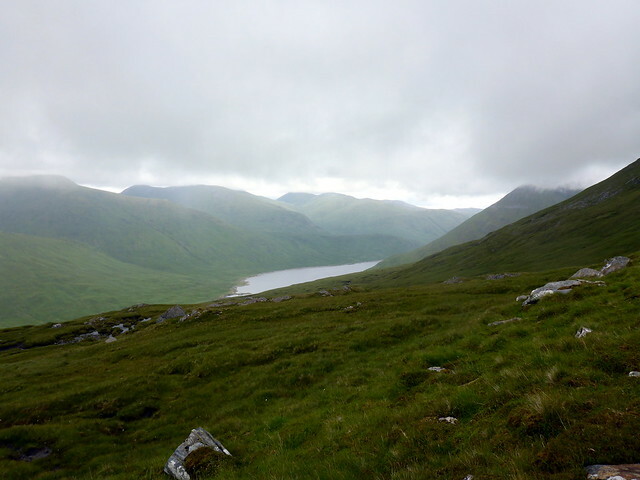 I was off on an 'epic' day trip to Mullach na Dheiragain and back. I noticed the tent in the field on my return at 9.00 p.m. too and did wonder to myself a) where did that come from (as I swear it wasn't there earlier in the day) and b) was it you and Allison. Hope I wasn't too noisy as I struggled to function while getting ready to head home. .
Ah - small world! You should have popped in to say hi. 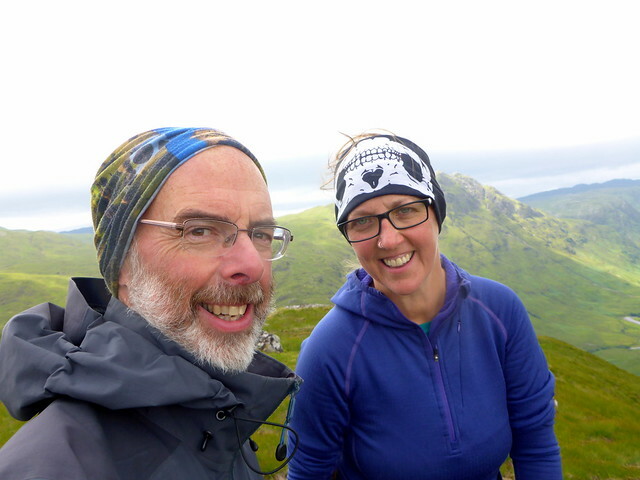 Hi PeteR myself and my friend Morag met you on the top of Mullach na Dreiragain, hope you had a good day? Do the report from that side please! Weaselmaster and Sick Kid I think you spoke to Morag I was further behind what beautiful mountains, glad we all had a great day...but long day! 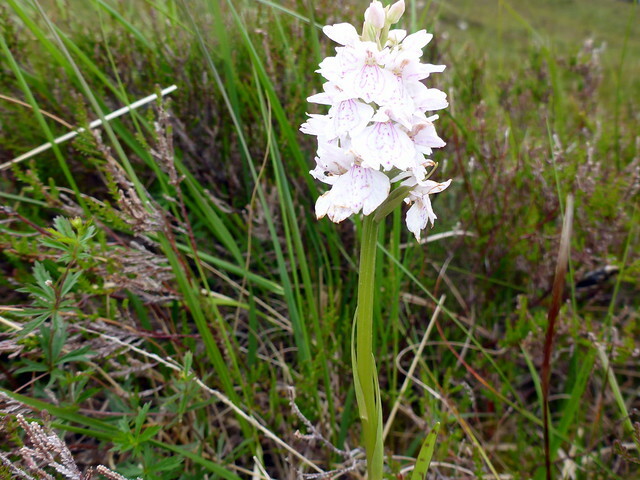 You got to some fine places on this one - C Cruithneachd looks very attractive, I must say. 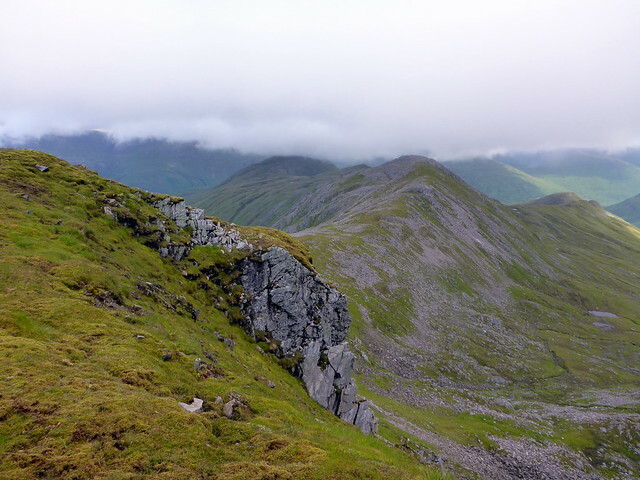 And Ceathreamhnan N Ridge also - the trouble with doing the Mullardoch round with a focus on the 12 means one misses this (unless one is mad enough to all the Mullardoch tops as well ). The pano of the ridge looks phenomenal - are the colours undoctored?? 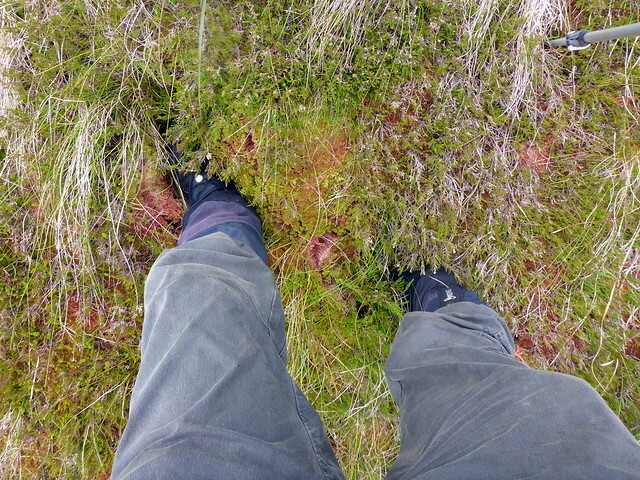 "wading knee deep through syrup sponge" - I had to smile: I had just that kind of experience on the Arenigs last weekend: huge leg lifts necessary to step over the thigh deep heather, then when you get your foot down, just as you lift the other leg your foot drops another 20cm or so. Pretty damned shattering!